A Burundian carrying a placard in French that says “We Burundians are united in our diversity, we are against the third term of Nkurunziza and no ethnic problems in Burundi” at a march in Bujumbura, June 5, 2015 (AP photo by Gildas Ngingo). 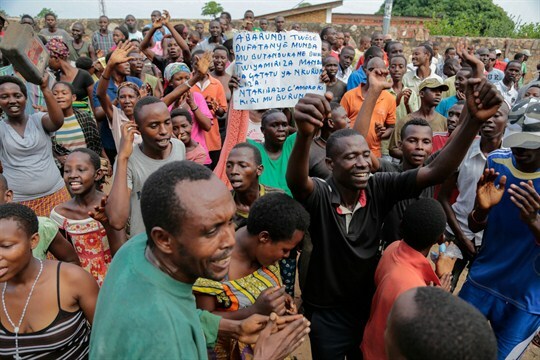 In early December, the tiny east African country of Burundi garnered international attention when its Foreign Ministry, at the request of President Pierre Nkurunziza, called for the closure of the U.N. human rights office in the capital, Bujumbura. The move was not altogether surprising from a regime once called one of “the most prolific slaughterhouses of humans in recent times” by former U.N. rights chief Zeid Raad al-Hussein. Still, it came as a blow to human rights activists who had pinned their hopes on the international reach of the United Nations.